Whether it’s covering up spider veins, concealing acne scars, or camouflaging your facial redness, nearly everyone has at least skin issues they want to hide. However, that doesn’t mean you have to hide. With the latest in modern technology at our fingertips, our friendly staff is dedicated to relieving various skin frustrations through multiple medspa treatments, including intense pulsed light therapy. Intense pulsed light therapy, also known as IPL or photofacial, is a non-invasive treatment that uses intense pulses of light to penetrate deep into your problematic area and effectively rejuvenate your skin. Say goodbye to the result of sun spots, facial redness, fine wrinkles, unwanted pigmentation and more. With IPL therapy, feeling confident in your own skin is easier than ever. Follow along to learn the ins and outs of intense pulsed light therapy, discover the treatment’s pros and cons, and decide if it’s the right treatment option for you. Intense pulsed light therapy is an advanced treatment that uses a multi-wavelength laser to restore damaged skin. Its technology allows for easy customization, generating greater patient satisfaction. Due to the advancement of IPL therapy, it’s important to completely understand its process before making any immediate treatment decisions. Here we will discuss the technology behind intense pulsed light therapy, what happens during your procedure, and the type of results you should expect. The Palomar Icon™ Aesthetic System is a state-of-the-art system that offers the latest in IPL technology. It works to remove even the most persistent stretch marks, sun spots, wrinkles, and spider veins—leaving your skin blemish-free. Its technology delivers maximum effectiveness with over 350 units of energy, making it the most powerful laser among all other leading brands. Successfully balancing safety and precision, the Palomar Icon™ Aesthetic System is one of the best ways to combat your challenging skin issues. The MAX G™ is an optimized light handpiece that works by sending low-energy beams of light directly into the affected skin. This technology allows for accurate precision while maximizing patient comfort and safety at all times. With the MaxG™, your unwanted pigmentation, sun spots, facial redness, fine wrinkles and other skin issues, can all be improved with both fewer and more comfortable treatment sessions. The Skintel™ Reader is the only FDA-cleared melanin reader. It accurately reads the amount of melanin within your skin to optimize effectiveness and safety during your IPL treatment. Knowing the amount of melanin in your skin helps our team of doctors better understand how you will react to a particular treatment to determine which setting is best for you. This knowledge helps us make educated decisions and minimizes the risk of over-treating your skin. Many other non-medical facilities that provide IPL treatments don’t initially test your melanin levels, which is why some patients experience negative results such as burns or scars. With the help of this technology at Arizona Dermatology, we don’t have to worry about relying on mere observation to determine how much light your skin can handle. Instead, we rely on the Skintel™ Reader to give us accurate and clinically proven measurements to produce your most desired results. Before the procedure, you’ll meet with our accredited doctors to discuss the different treatment options before making any decisions. Because your satisfaction is our top priority, we want to address any questions or concerns you may have to ensure that IPL therapy will best cater to your needs. 1. First, we will provide you with special glasses or eye pads for safety. 2. Next, cooling gel will be applied to the targeted area of skin. 3. When ready, we’ll release pulses of light evenly throughout the targeted area using our advanced technology systems. 4. After, we will clean off the cooling gel and apply a moisturizer to the area. Since this therapy is effective, yet gentle, you can reapply your makeup directly after the treatment, if desired. 5. Following the procedure, you can expect to experience noticeable results over the next 2-6 weeks. Results vary for each patient. After the procedure, you should expect some minor discoloring or swelling of the skin. These repercussions are completely normal and will reduce over time. The success of IPL therapy varies for each patient. The most common timeframe for seeing changes to your skin is between two to four weeks. The more you are exposed to intense pulsed light therapy, the better your results will become. For maximum results, we suggest going through three to five treatments every three to six weeks. We understand that with every treatment comes both risks and benefits. At Arizona Dermatology, our goal is to be as transparent as possible so that you know exactly what you are receiving from each treatment. Here you will discover the pros and cons of intense pulsed light therapy. Is IPL Therapy the Best Option for Me? 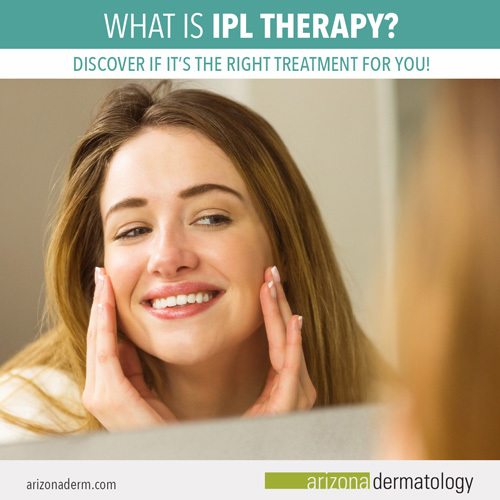 Now that you know all that IPL therapy entails, including the technology, procedure, and results you can expect to see, you might be asking yourself: is this the best treatment option for me? We know that IPL therapy isn’t for everyone, but don’t let that stop you from treating your problematic skin! We value your satisfaction which is why we have plenty of services to fit your needs. Browse through our medical, cosmetic, medspa, and skin cancer services to see what other treatments work best for your symptoms. As the largest organ in your body, it’s no surprise that your skin can suffer from a wide range of symptoms. Whether it’s acne, stretchmarks, freckles, or wrinkles, these issues have the potential to impact both your social and emotional life. Don’t let your problematic skin stand in the way of your confidence any longer. 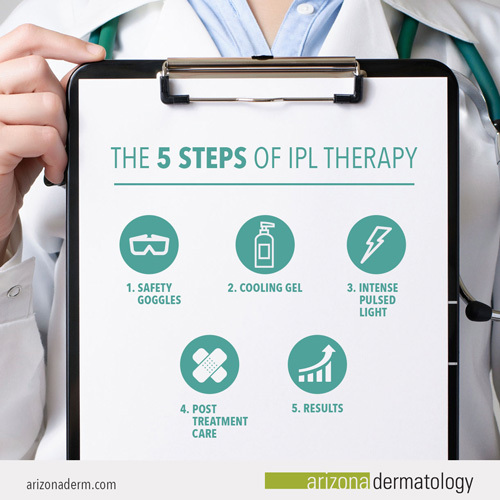 Contact us at Arizona Dermatology to discuss whether IPL therapy or any other treatment will work for you. We’re excited to hear from you, find a solution to your skin care needs, and give you the results you deserve!